Russia launched a spacecraft toward the Martian moon Phobos today (Nov. 8), initiating the nation's first deep-space mission since the mid-1990s. 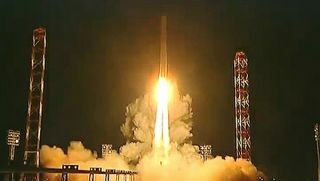 The unmanned Phobos-Grunt probe blasted off from Kazakhstan's Baikonur Cosmodrome at 3:16 p.m. EST Tuesday (2016 GMT; 2:16 a.m. local time Wednesday). Its main task is to pluck dirt samples from Phobos ("grunt" means "soil" in Russian) and return them to Earth, where scientists are hoping to learn more about the early days of Mars and the solar system. The $163 million mission could help bring Russian planetary exploration back to prominence after a decades-long dry spell marked by funding woes and high-profile failures. "The major outcome is that Russia might establish its credibility again," Roald Sagdeev, former director of the Space Research Institute (IKI) in Moscow, told the journal Nature. "It would open the door for major international missions." If all goes well, the Phobos-Grunt spacecraft will arrive at Mars in autumn 2012. A few months later, it will drop a lander onto the surface of Phobos, a potato-shaped moon 16 miles (27 kilometers) long that astronomers think is a captured asteroid. Asteroids are leftover material that didn't get incorporated into planets when the solar system was coming together 4.6 billion years ago. So Phobos dirt samples could teach scientists a lot about the early history and evolution of our cosmic neighborhood, researchers have said. It is also likely that some Phobos soil comes from Mars, blasted off the Red Planet by asteroid and comet impacts long ago. So Phobos-Grunt could send home tiny bits of Mars, which researchers would pore over to learn more about the Red Planet. Several other payloads are hitching a ride with Phobos-Grunt. One is a capsule full of microbes, an experiment looking into how life forms survive and behave over prolonged periods in deep space. Another is a small Chinese satellite called Yinghuo 1, which will separate from Phobos-Grunt and go into orbit around Mars. Yinghuo 1 is the first Mars probe for China, which recently celebrated the successful docking of two robotic vessels in Earth orbit — a milestone in the nation's quest to build a space station by 2020. Phobos-Grunt is the fourth Russian Mars probe to blast off since the late 1980s. The other three didn't do so well. The Phobos 1 and Phobos 2 spacecraft, which launched in July 1988, suffered critical failures before their missions were complete. And the Mars 96 probe crashed into the Pacific Ocean shortly after liftoff in November 1996. While Russia's human spaceflight program has ticked along nicely since then — it currently provides the rides for NASA astronauts to and from space — the program's exploration side has languished. Phobos-Grunt is the nation's first attempt at an interplanetary mission since the Mars 96 failure. So the stakes are high, and Russian space officials will probably be on the edge of their seats until the Phobos soil samples reach Earth in 2014. "We're worried about every single phase," Phobos-Grunt lead scientist Alexander Zakharov told Reuters. "It's like our child."